. S. Weppelmann, Spinello Aretino e la pittura del Trecento in Toscana, Florence 2011, pp. 273–75, cat. no. 63b, reproduced. Recognised as by the hand of Spinello Aretino since Raimond van Marle published it in 1924, this excellently-preserved panel formed the lateral element of a predella with stories of Christ. In the centre of the scene, the Virgin holds the Child, who is wrapped in a white mantle that reveals his left shoulder. Before him, the oldest of the three Magi kneels to kiss his little feet. Beyond them, in the background, a steep craggy slope rises, with two small trees and some scattered grass. In the foreground, on the left, the other two Magi, each wearing a golden crown, are in conversation as they wait to pay tribute to the Child. Behind the Virgin, Joseph observes the scene. With his right hand, Mary’s husband holds the small casket brought by the kneeling Magus, while with his left he lifts his ample yellow cloak, folded over his arm, which shows off the blue robe under it. With respect to other depictions of the same subject by Spinello – for instance the predella panel in the Galleria Nazionale in Parma – our scene has a more essential approach to narration, enhancing the monumentality of the protagonists, who all reflect a solid neo- Giottesque character. Yet Spinello is not averse to subtle touches of refined details, visible here in the hems, adorned with mordant gilding, the stippling of the haloes, and the attentive description of the dais, which is embellished by painstaking inlaid wood decoration, which recurs in a very similar way on the Virgin’s throne, itself covered by a richly gilded green fabric. 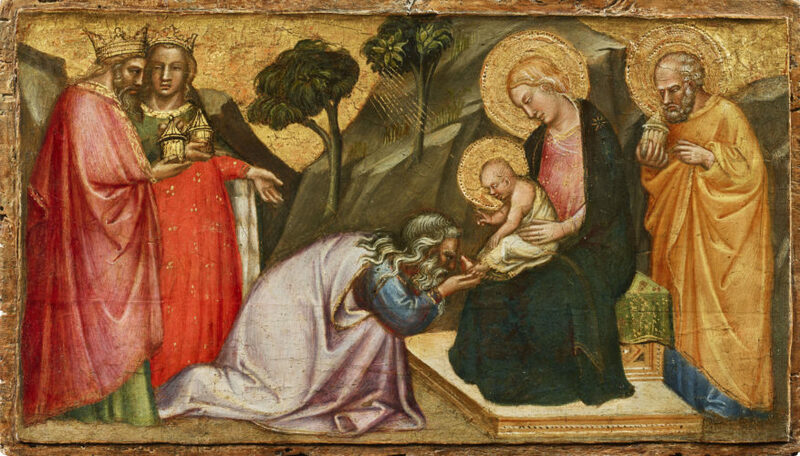 Spinello conveys the tender mood of the Virgin with a freshness and immediacy as she watches the Child, lively, smiling and almost amused as he blesses the kneeling King, draped in a bright, violet-tinged cloak. In 1975 Miklós Boskovits associated the Adoration of the Magi and a Nativity, now in a private collection in Genoa,2identical in style and dimensions to our panel, indicating that they formed part of a single predella, of which Gaudenz Freuler later recognised the central section, a Lamentation over the Dead Christ. Freuler justly noted that this last scene included a literal citation of two figures drawn from the frescoes by Antonio Veneziano in the Camposanto in Pisa, painted between 1384 and 1386: the woman kneeling at Christ’s feet in the Lamentation replicates the foreground figure in the Death of Saint Ranieri in Pisa, and the figure with the strongly foreshortened face kissing the hands of the Saint is the model for one of the Maries in Spinello’s panel. Consequently Spinello painted this predella following his second sojourn in Pisa, where he himself had frescoed Stories of Saints Ephysius and Potitus in the Camposanto between 1390 and 1391. The broad, monumental draperies with their broken folds, worn by Joseph and the Magi in our panel had already been used by Spinello in his works of the 1380s, as for example in the Apostles in the Dormition of the Virgin in the center of the predella of the polyptych of Santa Maria Nuova (1384), now in the Pinacoteca Nazionale in Siena. The beardless Magus, wearing a sullen expression on his oval face, seems a twin of the young Apostle from the altarpiece made for San Ponziano in Lucca, which was defined as nuper facta (recently completed) in Spinello’s contract for the Santa Maria Nuova polyptych. However, a dating shortly after the Pisan sojourn is suggested by slightly fuller and softer forms, and freer and more vibrant handling, typical of the painter’s maturity, as already evinced by the Sant’Andrea triptych in Lucca, dated in the same year, 1391, now housed in the Galleria dell’Accademia in Florence. It was thus in this restless period of Spinello’s activity in Pisa, Lucca and Florence, that the Adoration of the Magi was painted. The swift brushstrokes describing the hair, white beards and eyebrows of Saint Joseph and the Magi recall the flashing highlights of the frescoes in the Manetti chapel in the church of the Carmine in Florence. As in our panel, this cycle, datable to the early 1390s and only surviving in fragmentary form, has trailing draperies that imply the volumes of the bodies within them; this shows a more mature sensitivity to anatomy, revealing Spinello’s retrospective approach, inclined as he was to a passionate and studiously concealed rereading of the noblest antecedents of Florentine painting of the early Trecento, above all Taddeo Gaddi. The face of the Virgin, modelled with subtle brushstrokes and warmed by a living, breathing rosiness, depicted in the slightest of three-quarter views, could be a sister of the profile figure of Salome from the fresco of Herod’s Feast once in the Carmine and now a detached fragment in the Walker Art Gallery, Liverpool. There is also some bold foreshortening in the faces, both in the Florentine frescoes and the Nativity and Lamentation, companions to our Adoration of the Magi. A dating in these years is also indicated by the brilliant chromaticism of the clothing and the mellow brushwork of the flesh passages, now restored to their original vivid freshness by recent conservation, close to the rich palette of the Stories of Saint Catherine in the Oratorio dell’Antella near Florence. More recently, Weppelmann suggested connecting the predella of which our Adoration of the Magi formed part with the Virgin and Child with Saints and Angels in the Kress Study Collection at the Bucknell University Art Museum in Lewisburg. Indeed its width is similar to that of the Lamentation in a private collection, which would originally have been the central panel of a predella. Weppelmann also associated an Annunciate Virgin in an unknown location with the same reconstruction, as a pinnacle panel.